Help bring carsharing to the Monadnock Region! Carsharing is a transportation option that offers the benefits of having a car without the cost or hassle of private ownership. Well-known business examples include ZipCar and Enterprise Carshare, however carshares can also be set up as non-profits or co-operatives. 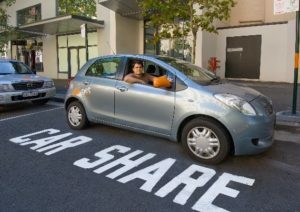 Carsharing is a usage-based rental service that gives members access to a dispersed network of shared vehicles. These vehicles are typically located at locations throughout a campus or community at unattended, self-serve locations. Membership in a carshare organization generally involves a sign-up fee in addition to a pre-qualification process that requires a valid driver’s license and a clean driving record. Once membership is established, vehicles are reserved online, through use of an app, or with a phone system. Carshare vehicles can be used for as little as 15 minutes up to several days. Members are charged a monthly fee plus an hourly or mileage based rate. Insurance, fuel, maintenance, parking and sometimes roadside assistance are typically included. In order to meet the diverse needs of their members, most carshares offer a variety of vehicles including sedans, trucks, and vans. When they are finished, members return vehicles to designated parking spots so they will be available for the next user. Carsharing is often confused with other mobility options such as traditional car rentals and ridesharing, but each has a distinct list of benefits and challenges. Rather than competing with each other, each mobility option fills a niche in addressing the transportation needs of the community. 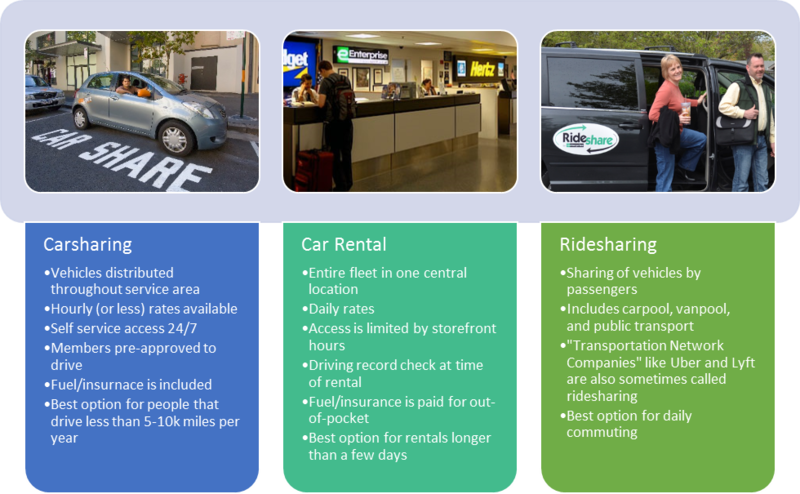 Carsharing offers many benefits to users and the community as a whole. Members can save money on transportation costs, and as a result carsharing can increase mobility and access for low-income individuals and families. It is estimated that each carshare vehicle replaces between 9-13 cars on the road. This results in congestion and parking relief and an associated reduction in greenhouse gas emissions. Carsharing also promotes health by reducing financial stress and promoting active transportation (i.e. walking and bicycling) for shorter trips. MAST is interested in working with community partners to better understand the interest in and demand for carsharing in Keene and the Monadnock Region. The Carsharing subcommittee will take a lead role on this project and report back to the MAST Steering Committee on a quarterly basis. Potential work tasks include conducting a public interest survey, reaching out to potential business or community partners, and researching potential funding sources. There is also the possibility of working with a student intern from an area college or university to help move the project forward. The expected time commitment is about three hours per month. This includes one hour per month spent in sub-committee meetings, and 2 hours per month outside of meetings. If you are interested in joining this subcommittee, please contact us.